I tried three new-to-me fruits – cactus pear, pepino melon, and pomegranate. 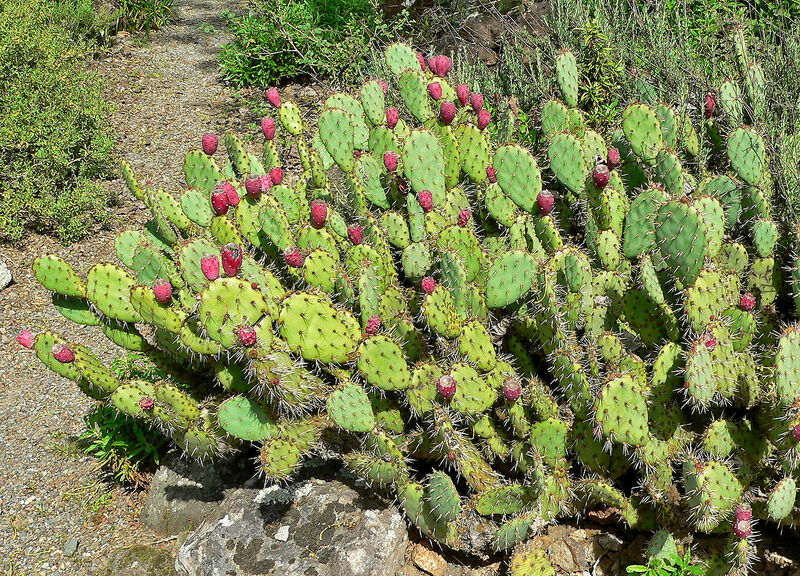 Cactus pear is the fruit of the prickly pear, or Opuntia. Also known as cactus fig and Indian fig, the plants grow all over the world in the proper climates. It can be found in South America (mine was grown in Chile), Mexico, and desert climates in the United States. It is also found in Southern France and Italy, Sicily, Portugal, Spain, Greece, Cyprus, Malta, Egypt, Eritrea, Libya, Saudi Arabia, Jordan and many other places. I got my cactus pear at a grocery store (Wegmans!) and all of the prickly parts had been removed. There are many warnings about touching these fruits without proper gloves, and taking care not to touch the fruit even if the spines have been removed. They also have something called glochids, which you don’t want to mess with. The insides of the fruit are a deep red. The meaty pulp is heavily speckled with seeds, which are extremely hard. We removed the meat and then strained the seeds out of it. The texture of the fruit seed to me to be quite similar to quava or mango – lots of liquid contained within the meat. It was sweet and enjoyable (except for the prevalence of seeds!). It also stained my fingers a slight pink from eating a tiny piece. You know I love my health protein shakes these days! Mom and I are going to add some fruit puree (minus seeds) to our shakes. I would also love to try dyeing some fabric with the gorgeous red fruit. Here are some recipes I’d like to try using cactus pear. This entry was tagged cactus fig, cactus pear, opuntia. Bookmark the permalink.